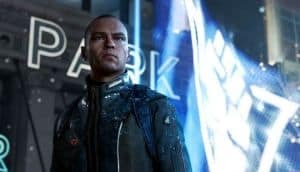 Detroit: Become Human Launches in May | Nerd Much? Out of nowhere comes news this morning of a release date for Quantic Dream’s upcoming game, Detroit: Become Human. And it looks like we’ll all become human sooner than we may have expected. As the player, you’ll take control of the story’s three androids throughout the adventure. Kara (Valorie Curry) is a newly created android who becomes a fugitive due to her quest for freedom. Markus (Jesse Williams) is an android who seeks to free all others like him as he attempts to ignite the android revolution. And Connor (Bryan Dechart) is a police model who is tasked with tracking down misbehaving androids such as Kara and Markus. The unique story doesn’t sound like a mere bullet point for the game. Quantic Dream stresses that your actions as you play Detroit: Become Human will reflect heavily as you continue on. Entire scenes and segments can be experienced or missed depending upon your personal experience. And specific characters you meet within the game could become your closest allies or perish shortly after their introduction. It’s all up to you. Detroit: Become Human has been in development since 2013. It’ll be exciting to see what David Cage and his team have in store for us when it finally launches on May 25th.